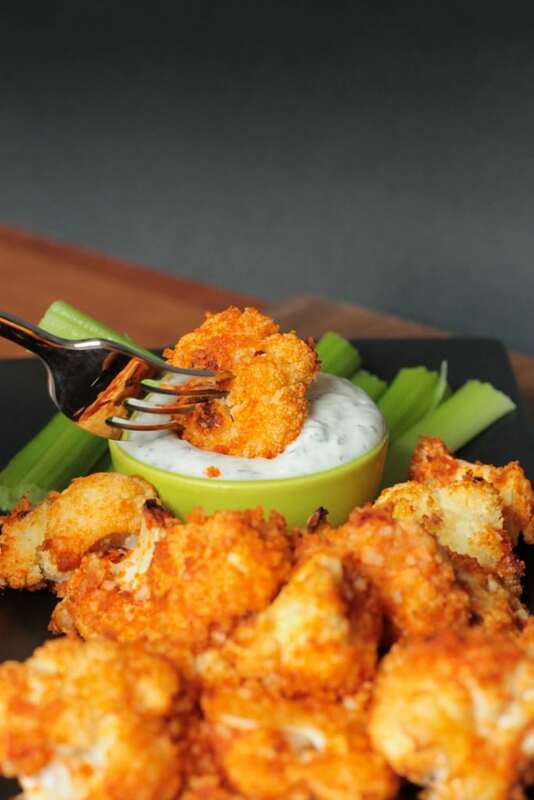 Buffalo Cauliflower Bites – a meatless version of your favorite buffalo wings. No breading station required – these are so easy!! I’ve seen various different recipes for these cauliflower bites floating around online. Most of them seemed to have some sort of tedious breading involved. While I do love breaded things, it sure does take a long time and makes a big mess. I wanted to find a way to make these without the need of a breading station. 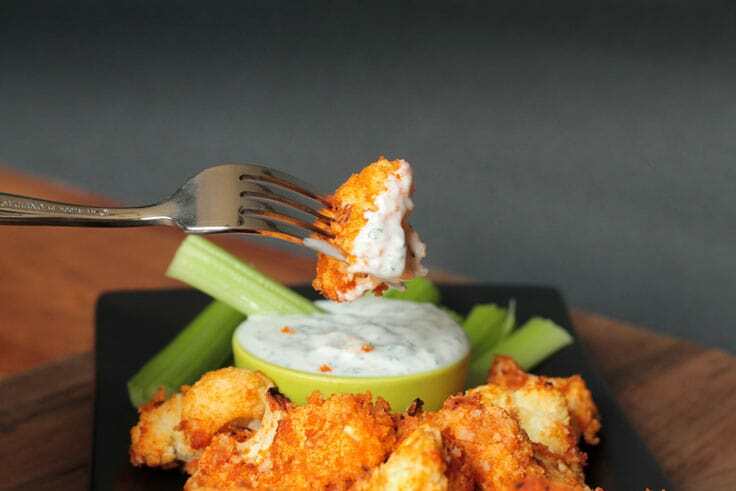 These Buffalo Cauliflower Bites still have a crunch from the Panko breadcrumbs, but the breadcrumbs are just loosely shaken on, which actually makes them a bit healthier because you can use less. It also makes them super easy! And addictive. Oh my, I think I may have eaten the ENTIRE head of cauliflower by myself. Oopsy! These tangy spicy bites are the perfect appetizer, game day snack or late night munchie. 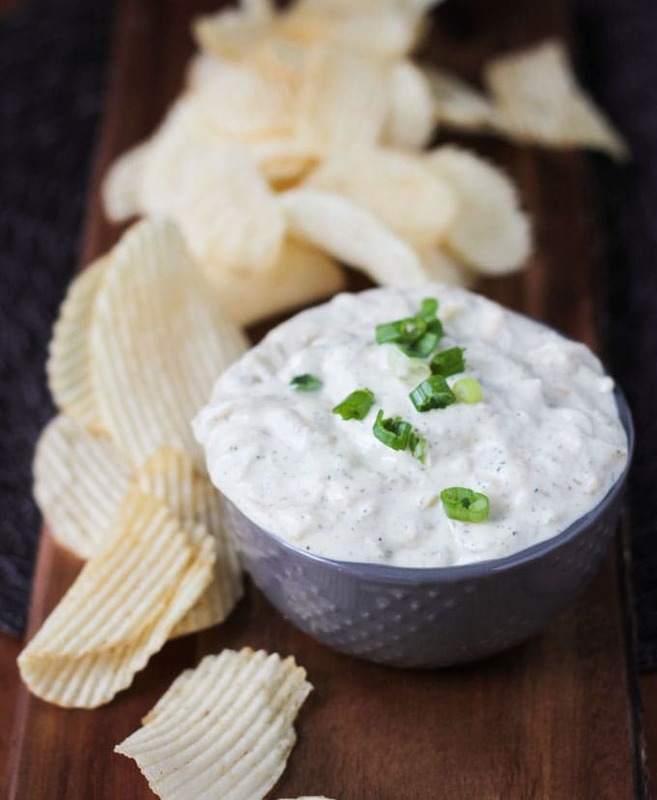 Serve ’em up with this Cheater Vegan Ranch Dip and I dare you to try to stop eating them. I call this dip “cheater” because I used a store bought processed ingredient as the base. Most vegan ranch recipes call for silken tofu or cashews soaked for 3-4 hours. I didn’t have tofu and I didn’t want to wait 3-4 hours for my cashews to soak. A quick look around the fridge to see what else I had on hand and voila, Cheater Vegan Ranch was born. And because these are made with cauliflower instead of the traditional stuff buffalo bites are made with (chicken), they are healthier! So go ahead and chow down guilt free! I hope you love these Buffalo Cauliflower Bites as much as we do. If you try them, please come back and leave me a comment below with your feedback and rating. You can also find me on social media. Be sure to tag @veggie_inspired and #veggieinspired so I’m sure to see it. Enjoy! In a large bowl, drizzle the olive oil over the cauliflower and toss to coat well. Pour the breadcrumbs over and toss again to coat. Pour cauliflower onto a parchment lined baking sheet and spread out into one layer. Roast for 20 minutes or until cauliflower starts to get tender. Take out of oven and pour back into the large bowl. Place back on baking sheet and roast for another 10-15 minutes or so until cauliflower starts to get crispy on the edges. Meanwhile, make the Cheater Vegan Ranch Dip. Combine all ingredients in a high speed blender and blend until combined. Take cauliflower out of oven. Serve with Cheater Vegan Ranch Dip. ~Some brands of vegan sour cream are thinner than others. If yours seems very loose, start with only 2 tbsp of soy milk and then add more, 1 tbsp at a time, until you reach the desired consistency for dipping. Hey this looks frrakon delish! Ive been wanting to make these for quite some time but wasn’t down with the breading thing so this is perfect! Before I make it, I want to ask, can I use almond milk instead of soy milk in the vegan ranch? So excited, cant wait to try it! Hi, Zoe. Yes, almond work will certainly work as well. Enjoy! I made these last night, I followed all the instructions but when the cauliflower came out of the oven they were super soggy. What did I do wrong? Also, the breadcrumbs weren’t really sticking to the cauliflower and the cauliflower was pretty covered with the oil. Thanks for your recipes. 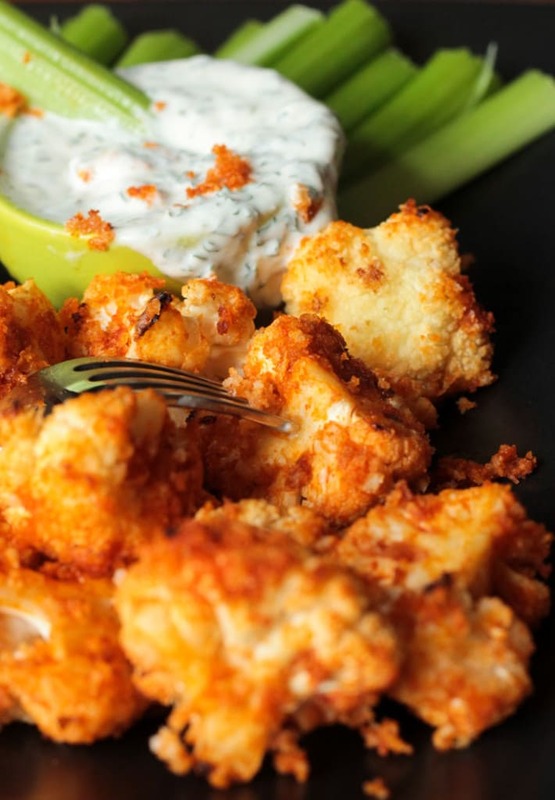 I will definitely be trying more of them and tweaking this buffalo cauliflower one. Hi, Kara. I’m thinking it was too much oil for the size of your cauliflower. The cauliflower shouldn’t be totally coated in oil…just a small drizzle to help the breadcrumbs stick (even though some of them will still fall off). You should really be able to see the oil on the cauliflower – they should still look dry. Also, did you use Panko breadcrumbs, not regular ones? Panko are definitely crispier and hold up better. Thanks for your comment. I hope it works out better next time. I made these for dinner tonight. I had a problem with the panko not sticking though. It just ended up a soggy pile of crumbs on the bottom of the sheet pan. Any suggestions? Also, that “ranch” dip is killer! 1/2 a cup of soy seemed like a lot to me so I just added a slash at a time until I had the consistency that I wanted. The addition of the lemon the dip was lovely. Thanks for the recipe. Hi, Heather. Did you use the oil? The only thing I can think is if the oil wasn’t dispersed enough, so the cauliflower was too dry for the panko to stick. Also, I usually add more breadcrumbs after adding the hot sauce just to make sure they are coated well. Glad you liked the flavor and the ranch! Check out my Baked Cauliflower Tacos too – they are crispy and delicious! (And basically foolproof!). Can coconut oil be used instead of olive oil? I’ve just run out of olive oil and won’t be able to go get someuntil the morning. Hi! I was wondering how long these keep for? I want to make them and bring them over to a friend’s house and I’m wondering how long they stay good for. Maybe I should do the final cooking step at their house…? Hi, Katie. They are best straight from the oven. They will lose that crispy outside once you store them. Definitely do the final step at their house! Enjoy! The ads are served to each person differently based on their own recent online searches. Hi, Liz! Panko are coarse breadcrumbs. They are super crunchy. But, you could use regular breadcrumbs if you can’t find them. Or you could make your own by blitzing some bread in a food processor and baking it until crispy…just be careful not to burn it. As for Buffalo sauce, I’m not sure of an alternative to that. You could use straight BBQ sauce, but it definitely won’t have the same flavor. Buffalo sauce is a spicy, tangy sauce. Can you shop on Amazon? Or are the shipping fees outrageous to Switzerland? I can’t wait to try your recipe, Jenn! It’s different from the one I usually make, and sounds a lot easier! Thanks, Amy! This is definitely the lazy man’s version, but it tastes just as good! Hope you love it! Love this recipe so much! My carnivore boyfriend asks me to make them at least once a week so I would say it’s a hit in my house. Definitely learned not to use any soy milk in my cheater ranch though– the tofutti “better than sour cream” makes it way too runny for any more liquid. Letting it thicken up and the flavors sit overnight seems to make it perfect. Thanks for the amazing recipe! Thank you, Holly! I’m so glad you guys like it. I need to revisit the ranch and work out the kinks as many have said theirs is runny. Glad it thickens up over night, but I think I need a quicker method. LOL! Thanks so much for your feedback! I made my own vegan sour cream with raw cashews, nutritional yeast, lemon juice, sea salt, and water, then made the rest of ranch recipe, and together was VEGANlicious!!! Perfect consistency and I added a bit more olive oil to the cauliflower and used large container to shake it up in and the Pablo worked perfectly! Thank you for the recipe! Hi, Tiffany. Did you add more breading after you added the buffalo sauce? It’s the breadcrumbs that should get crispy, not the cauliflower necessarily. If you did that and it still didn’t turn out, it might have just needed more time in the oven. Every oven is different unfortunately. Thanks for trying them. I hope you liked the flavor! Oh, boo! 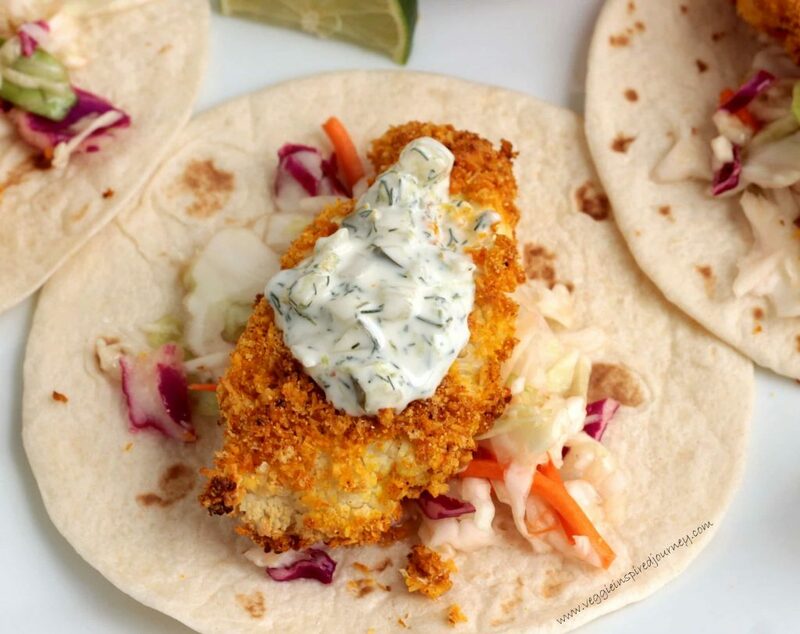 And you used the Panko breadcrumbs, not regular breadcrumbs? Maybe after you add the sauce, put them back on the baking sheet and then sprinkle more Panko. Glad they tasted good, though! Love it very much, I’m not sure if I did something wrong. They weren’t crispy and my dressing was all liquidity. Hi, Susan! I’ve had 1 or 2 other people tell me their dressing was too liquidy too. I think it must be the difference in brands of vegan sour cream. I honestly don’t remember which one I used. Next time, start with 2 tbsp of soy milk and work up from there until you get the consistency you like. I’m going to change the recipe to note that as well. As for the crispiness – the cauliflower florets won’t be crispy, but the breading should be. Was your breading crispy? If not, maybe you just need a few more minutes in the oven. I’m glad you liked the flavor though. Thanks so much for your feedback! My ranch dip was very runny too but I added corn starch and it became much thicker! Glad you got it to work out, Katherine! Thanks for the tip! Hi, Isha. I’m sure that would work…like a traditional breading. Enjoy! Loved this recipe so much! I used a finer bread crumb and they stuck like a charm. Also, I substituted greek yogurt for veggie sour cream (couldn’t find any at the regular grocer), and I added a little more yogurt to thicken the ranch. It was great! I’ll definitely be making this again! Thank you! Oh, that’s so great to hear, Ann!! Thank you so much for stopping by and giving your feedback. I’m so happy that you loved it! Greek yogurt sounds like an excellent sub for those that don’t mind dairy. Thanks! Have a great week! Hi Ann! What bread crumb did you use? I usually use panko but like others that I’ve seen post, mine don’t always stick. Seems like a finer crumb would work great! I can’t wait to try this! Hi, Cameron. You can pulse your panko in a food processor (or coffee grinder) a few times if you want to make them finer. I hope you enjoy! Was so excited to try this only to be disappointed. The panko did not stick, they did not crisp up. I’d rather broil naked cauliflower and just put buffalo sauce on it. Very bummed. Loved the idea. Oh bummer, Miley! I’m sorry it didn’t work out for you. Not sure what went wrong as I’ve made them numerous times as have many readers and they always turn out. But, broiled cauliflower with buffalo sauce would be great too. Im excited! (I know im sad)… I’m going to make these tonight, will let you know how it goes ? Not sad at all! I hope you love them. Please come back and let me know how they turn out! I just made these and I do not know what happened but they turned out soggy! I think it might have been too much EVOO. When i went to mix the cauliflower with the buffalo sauce all of the panko breadcrumbs came off and stuck to the bottom of the bowl. They did not get crispier either as I baked them for the last 15 minutes. Luckily I love anything buffalo so they still tasted great just had to use a fork instead of my fingers! Oh man, Jessica, that’s too bad! I’m sorry it didn’t work out. It could be you oven temp is quite a bit different than mine. Maybe try baking them at a higher temp next time…and maybe even a little longer…before mixing with the sauce?? I’m glad you loved the flavor though! Yeah I don’t get the ranch recipe… half cup of veg milk and half a cup of veg sour cream gave me ranch soup. Went back and read the recipe several times as i thought i mustve missed something, but didnt. Had to throw it away and remade it without the soy milk. Sorry the ranch didn’t work out for you, Aly. Probably a difference in brands…I wish I remembered which ones I used. But, I’m glad you were able to make it work the second time by adjusting. Hope you liked the cauliflower! My least favorite thing about most cauli wings is the batter and mess involved. I’ll be doing this next time! Thanks for sharing. So much easier this way! Thanks, Nicole! 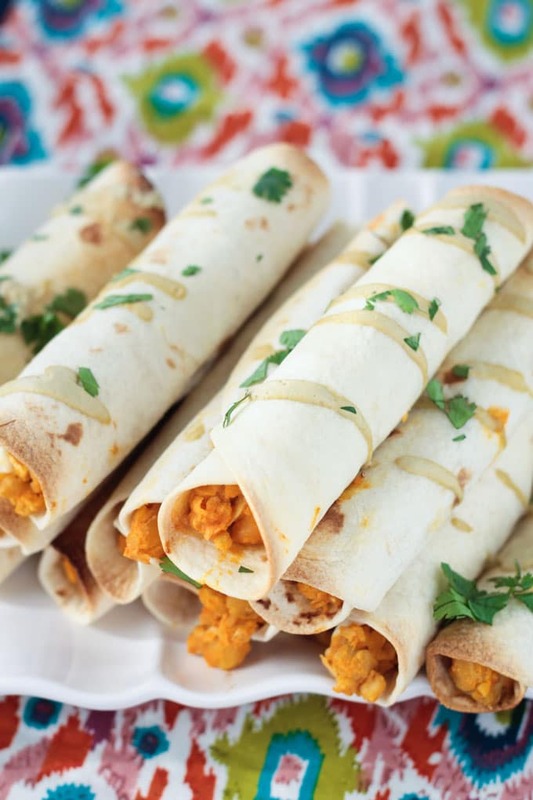 These buffalo cauliflower bites look so delicious! Like you, I’m not always in the mood for the time, effort, and mess of breading something. What a great alternative! And I bet the panko makes the cauliflower extra crispy. Yes! Gotta love panko! Thanks, Cadry! I have not tried broccoli, Alex. I can’t wait to hear how it turns out! I do love crispy roasted broccoli. I’ve always been a cauliflower lover but you might have just turned that love into obsession Jenn <3 such an amazing appetizer!!! And that sauce! Thanks, Lucie! It is quite addictive!! Drooling! Holy crap those look good. I just bought a head of yellow cauliflower. Making these! Thank you, Linda!! I am not ashamed to say I have eaten an ENTIRE batch myself in the past. Super addictive!! Can’t wait to hear what you think! This cauliflower snack sounds super yummy. I’ll have to go easy on the heat ’cause of The Hubby. But we both love roasted cauliflower. This takes it to a new level. I’ll have to try that dip too! I love crispy cauliflower of all kinds! These look especially delish, well buffalo sooooo drool! Have I commented on this before? I must have seen this because it screams my name! LOL, thanks, Sophia! Crispy cauliflower is the best! Oh my goodness, these look so good! 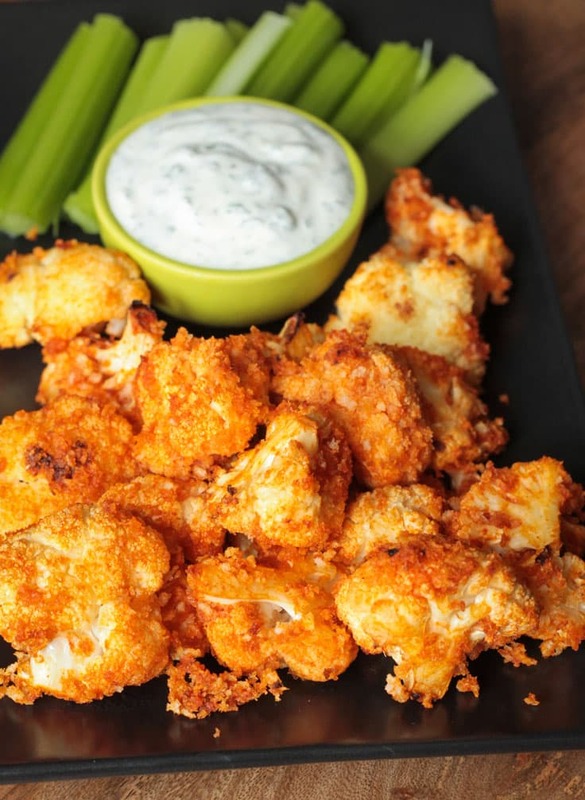 I love Buffalo cauliflower, but it’s so hard to get it nice and crispy without frying! The panic definitely helps with the crispy! You will LOVE these!! Thanks, Becky! These cauliflower “wings” look so delicious! These look amazing, Jenn! Can’t wait to give them a try! 🙂 And that sauce!! YUM! Thank you, Sina! They are super addictive! These were amazing, Jenn. Left the most epic burning sensation too (erm….due to consumption with beer). Hey, I can’t control what you consume with it…but I would guess it was probably worth it anyway. LOL Thanks, Arman! So happy to hear you loved them! These are just so darn cute and they sound delicious! I’ve never thought to bread cauliflower. Thanks, Alisa! Steamed and breaded cauliflower was a staple growing up. My dad I would drizzle malt vinegar over it. OMG, soooo good! Now, I would use balsamic. Now that’s an interesting family recipe tradition! Love this no-mess breading trick. I’m definitely going to try these! Maybe I can get my toddler to reconsider his stance on cauliflower. Thanks, Becky! They are quite spicy if you use the buffalo sauce. My kids tend to like spicy, but just a fair warning in case yours doesn’t. 🙂 Enjoy! These look amazing! So, so, so good! I love the cheater vegan ranch dip – haha, sometimes it has to be quick and easy so this one would be perfect for those times! Yes, totally! I don’t usually take the cheat way, but sometimes you just gotta do it! Thanks, Bianca! Please let me know if you try them! These look wonderful and so crispy!! I don’t like cauliflower (weirdo I know! ), but these would change that, the texture looks spot on! Love that dipping ranch too! What? First bananas, now cauliflower!! The horror! LOL! They are quite addictive is you ask me!! Thanks, Brandi! I just made this and am in awe. It’s so good. Finally a replacement for wings. I’m so glad you loved it! Thank you so much for stopping by to let me know! Enjoy!